Everyone loves an angel. Beloved and acknowledged across cultures and faiths, they are a symbol of comfort and protection; a universal nod to Love and Grace, an acknowledgement of that which is unseen. 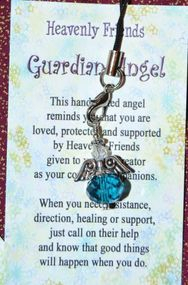 Chances are you have an angel or two on a shelf or one danging from your rearview mirror in your car. We have an affinity for these wonderful, reassuring beings. Created by Deborah with love and attention to detail, these delightful little angels are now available to groups and organization at wholesale prices. 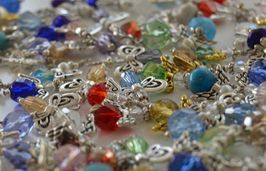 Made with sparkly Swarovski crystal, semi-precious beads, glass pearls and other beads, they are perfect for fundraisers and gifts for volunteers, shut-ins and people in hospital. Each Guardian Angel is a little different from the next - some may have clear crystal heads, some may have pearlized heads. Some are larger and some are more petite. Something for everyone! The angels are fitted with a jump ring and a little lariat, come on a lovely backing card and presented in a clear cello envelope. They can be popped onto a purse strap, used as a zipper pull, placed on a chain or cord and worn as a necklace, or hung in a special place in the home or office as a reminder of Divine Love and protection. The crystal bodies may be the same colour but be a little different in shape - some are teardrop, helix, round, oval, or even vintage. 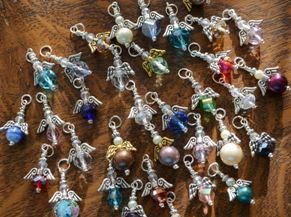 We'll send you a wonderful assortment of angels made especially for your group. 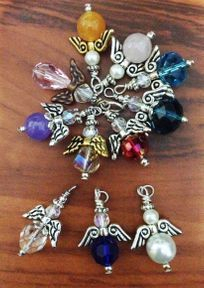 Angels are available in lots of 25 pieces at $5 per angel. Order 100 or more for a price break of $4.70 per angel. Order 200 or more for the best value: $4.44 per angel. We can create a custom card for you at an extra fee. We pay the tax! You must make payment arrangements for your angels at the time you place the order. Rush shipping can be arranged. Orders will be sent in 10 business days via Canada Post expedited mail.